Bavaria is one of the most popular and most scenic travel destinations in Germany. For many, Bavaria means sausage, beer, and lederhosen, and although you’ll find all of that on your vacation, this part of Germany has much more to offer. If you want to escape the crowds and experience the down-to-earth Gemüetlichkeit Bavaria is famous for, make sure to spend time in some rural villages along the way. One of the most popular regions is the beautiful Allgäu. Stop in a town you never heard of before, head to a Gasthaus (restaurant) for some Bavarian fare, buy some goodies in a local store, and take a hike in the surrounding area. Here are the most exciting things to do in Bavaria, from city breaks, and nature spots, to castles, scenic drives, and historic sites. Munich—or München—is the capital of Bavaria and gateway to the Alps. It is one of the most beautiful cities in Germany and offers first-class museums and traditional German architecture, a salute to Bavaria's royal past. Whether you sun yourself in Munich's English Garden or make do with rainy day activities, Munich is the Germany most visitors dream of. The world's most famous castle, Neuschwanstein, is nestled in the Bavarian Alps and comes straight out of a fairy tale. King Ludwig II designed his dream castle with the help of a theatrical set designer, and it has inspired modern fairy tales such as Sleeping Beauty's castle in Disneyland. You can take a tour through the flamboyant castle's interior. Highlights include a gaudy grotto, the Throne Room with its giant crown-shaped chandelier, and the lavish Minstrels' Hall. Oktoberfest is the world's largest fair and one of the best festivals in Germany. Every year, more than six million visitors from all over the world come to Munich to drink beer, eat sausage, and join together in song. The festival is famous for its huge beers in massive steins, but there is more to the Oktoberfest: link arms with locals, swing to the oompah of Bavarian bands, admire traditional costumes, enjoy hearty food, and get a good helping of German hospitality. The 950-year old city of Nuremberg (Nürnberg) is alive with history. See the Imperial Castle, which was the residence of Germany’s Kaiser and kings; check out the romantic Old Town with original timber-framed buildings; rub the Schöner Brunnen fountain for luck, visit Albrecht Dürer’s House, and see the Nazi Rally Party Grounds. During the holidays, the Old Town becomes a winter wonderland when Nuremberg celebrates its Christkindlmarkt, which is one of the country’s best Christmas markets. Need a warm-up? Order a plate of signature Nuremberg Rostbratwürste. Whether you're walking, hiking, mountain biking, or skiing, the Alps are one of Bavaria’s (and Germany’s) premier holiday destinations. Running along the border between Germany and Austria, the Bavarian Alps are home to Germany’s highest peak, the Zugspitze, where you can go glacier skiing until May. Some of the most well-known resort towns in the German Alps are Oberstdorf, Füssen, Berchtesgaden, and Garmisch-Partenkirchen. Garmisch-Partenkirchen is best known for the 1936 Winter Olympics, but a lot has happened since then. 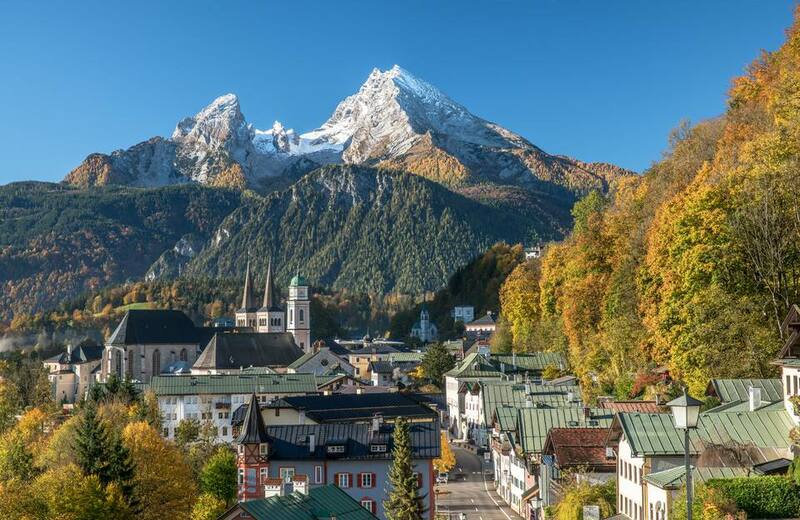 The two Bavarian towns joined shortly before the Olympics and together, Garmisch-Partenkirchen remains one of Europe's top winter sports destinations. The Eagle’s Nest (Kehlsteinhaus) was a gift from the Nazi party for Hitler’s 50th birthday. Perched on a mountain summit close to the town of Berchtesgaden, its construction in 1939 was an architectural phenomenon. You can tour a vast underground bunker system, then head through a tunnel to the original brass elevator, built right into the rock, which brings you up to Hitler’s mountain retreat. The chalet, where Hitler entertained world leaders, is now a restaurant and beer garden, both offering stunning views of the Bavarian mountains. The concentration camp of Dachau, which is 10 miles northwest of Munich, was one of the first concentration camps in Nazi Germany and would serve as a model for all subsequent camps in the Third Reich. Dachau visitors follow the "path of the prisoner," walking the same way prisoners were forced to after their arrival in the camp. You will see the original prisoner baths, barracks, courtyards, and the crematorium, as well as an extensive exhibition. Located over seven hills, this Bavarian town is nicknamed the "Franconian Rome." Bamberg has one of Europe’s largest intact old town centers and is a UNESCO World Heritage Site. Its early medieval plan, winding narrow streets and half-timbered architecture is the holy grail of fairy tale Germany. But the city is more than just a gorgeous still life. The University of Bamberg brings in more than 10,000 students, the nearby U.S. army base has around 4,000 members and dependents, and there are nearly 7,000 foreign nationals that reside here. The city is also well-known for its glorious beer tradition. Its many breweries and Biergartens are a continual source of entertainment, plus they offer a Bamberg specialty, Rauchbier (smoked beer). Rothenburg ob der Tauber is a fortified town and is one of the most visited spots in Germany. Famous for its medieval architecture, half-timbered houses and cobblestone lanes stretch from one wall to the other in this perfectly preserved town on Romantic Road. Take a tour with the nightwatchman, walk the ramparts, and celebrate Christmas year-round.